Worker's Compensation claims cover any injury that occurs at work. In Missouri, your company is required to provide healthcare to you for your injuries. However, they get to choose your doctors, and their doctors say when you are "better". Often times their doctor says you are "better" when you are not. Read the Missouri Workers Compensation Law and see if you can make heads or tails of it. Or, hire an attorney who knows the law and will fight to get you what you deserve for your injuries. If you have a work-related injury, you may be eligible for Missouri workers' compensation benefits. Employees who are injured on the job are eligible to collect workers' compensation benefits while they recuperate. Anyone who has been involved with a worker's compensation claim will tell you it is confusing, it is overwhelming and it often feels like being trapped in a legal maze. If you are involved in a work injury situation in St. Louis, you will benefit from having a knowledgeable attorney at your side. In Missouri, your company is required to provide healthcare to you for your injuries. However, your employer gets to select the physician. And their doctors decide when you are "better" and able to return to work. Often times their doctor says you are "better" when you are not. You should be receiving treatment for all of your injuries incurred, not just the ones the insurance company wants to accept. Having a legal expert on your side to advocate for your rights is essential in receiving proper and long-term care. Unfortunately, there are times your work injury claim may be denied or you may not receive all the benefits you deserve. If this occurs, you should consider working with an experienced workers' compensation lawyer. The insurance company will have their own lawyers and you will be at a serious disadvantage if you proceed without an attorney. The law states that an employer is not allowed to retaliate against an employee for filing a workers' compensation claim. This means you cannot lose your job over a worker's compensation claim. A lawyer will help protect your job and your livelihood. Worker's compensation claims are complex and the laws are always changing. For example, just this year Missouri lawmakers passed a bill to raise the standard for employees to sue for discrimination over workers' compensation claims. An attorney can help you navigate the confusing maze of legal requirements for worker's compensation. 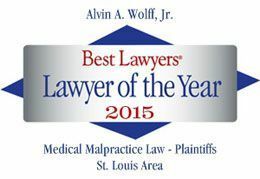 At Wolff & Wolff Trial Lawyers, we provide over 90 years of legal experience. We are experts in the law and will fight to get you what you deserve for your work injuries. If you have questions or believe you are not getting fair compensation, we can offer you skilled assistance in the St. Clair, St. Charles and all neighboring communities. Contact our offices immediately for support of your worker's compensation issue at (314) 241-2500.